The powder coat looks great! "Little disasters" are just part of the game. Having received 3' of 5/8" 1144 steel rod, I proceeded to attempt to duplicate the broken vertical stay. What followed was success followed by other disaster. That said, I think I have found a sound way forward to replace all 8 of the stays with steel. 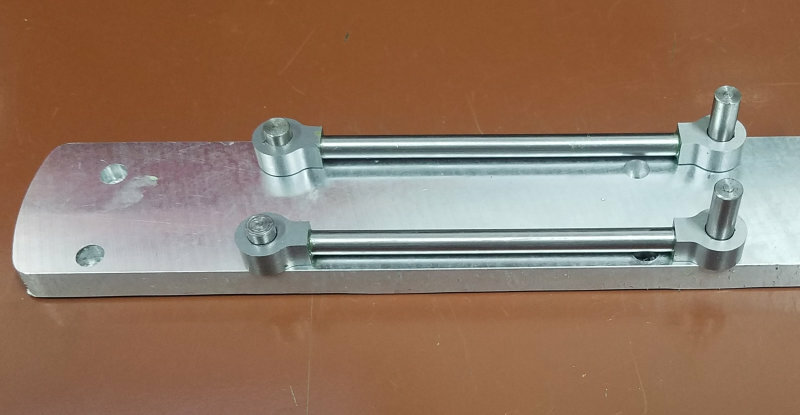 After cutting and facing to length, I mounted the rod in a collet block, clamped in the vise against a vise stop, and zeroed the mill. Then milled the two sides of the rod to 7mm thickness. 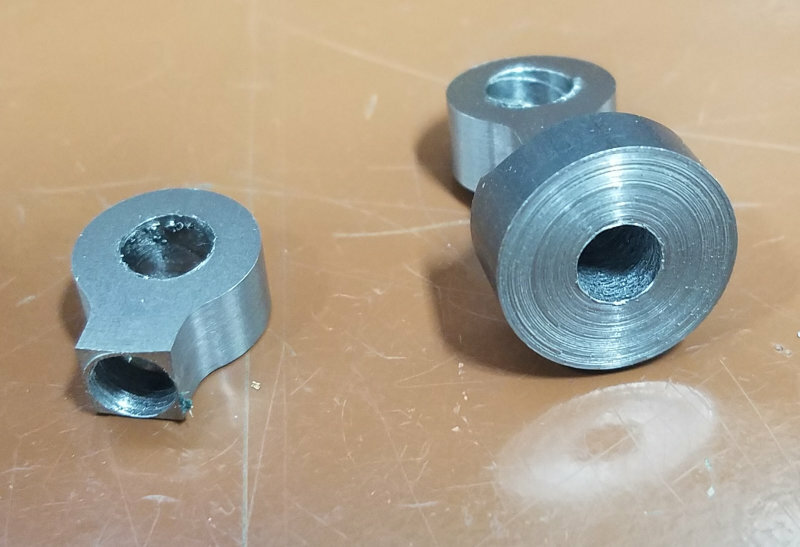 The vise stop allowed me to turn the collet block 90 degrees and refasten without losing my zero. The same endmill then profiled the head. Moving to the lathe, the base is turned to .375" allowing holding from this end. Drilled and tapped 8-32. 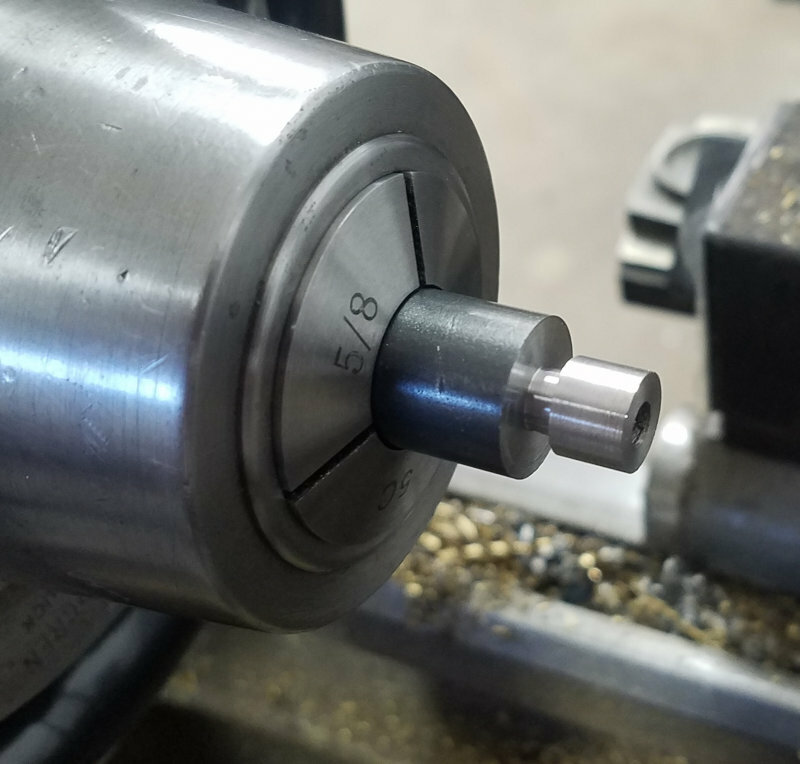 I reversed the work in the lathe and center drilled the head with a #1 center drill. When I started to turn the shaft, it became clear that then live center wasn't turning. After examination, I discovered that the sharp point of the live center had become dulled somewhere or other and didn't fit the hole. Rather it had broken the thin wall between the hole and the edge of the head. I managed without using a center to turn the shaft down to just over 6mm by progressively exposing about 10mm of shaft from the collett. Once I had done the entire length, I used a parting blade to try to even up the diameter, cutting about .002" deep each pass. Then after some sandpaper and scotch brite, the shaft looked decent but not perfect. 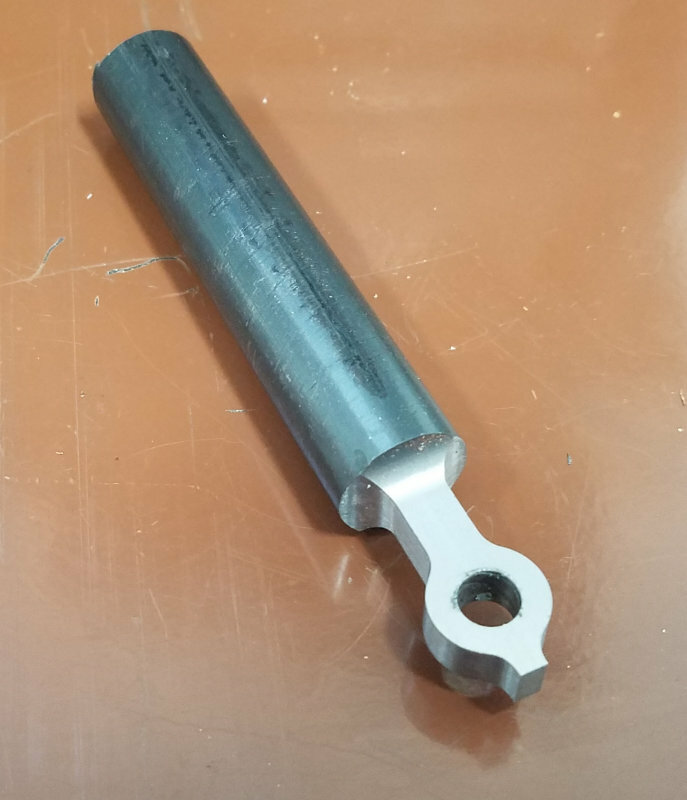 So now the goal was to machine away the top of the head with the ugly hole. To hold the piece, I tried clamping in a V block using a height gauge to ensure the head was horizontal. Then clamped in the Vise and used a wiggler center finder to zero on the center of the hole. Then came disaster #2. 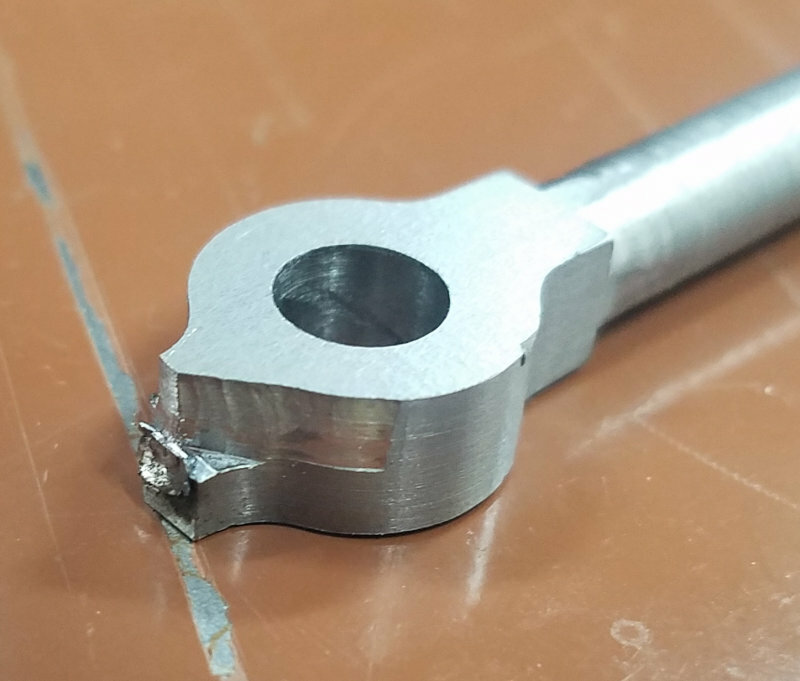 The clamp isn't strong enough to resist machining forces, so the first endmill contact caused the piece to both slide back and rotate. 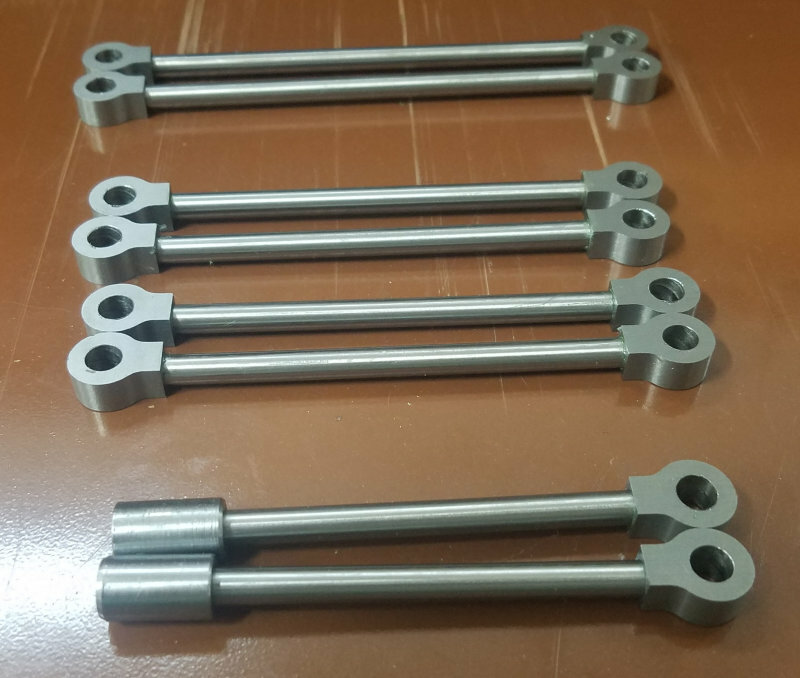 Going forward, my intention now is that each stay will have separate heads made as above, connected by some 7/32" diameter drill rod for the shafts. 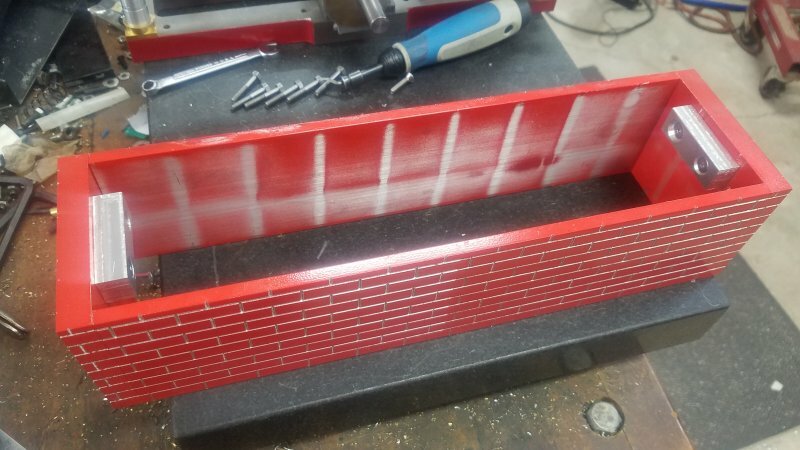 They will be assembled with loctite using a jig for proper spacing. Probably no shop time until Thursday. Started on the "separate head" idea and discovered that with a 6mm width, the 7/32 shaft is too close to the walls. So now the head will be 7mm thick , and the neck 7mm wide. Did a trial single that seems to work. Next on the mill mount the collet chuck and center. 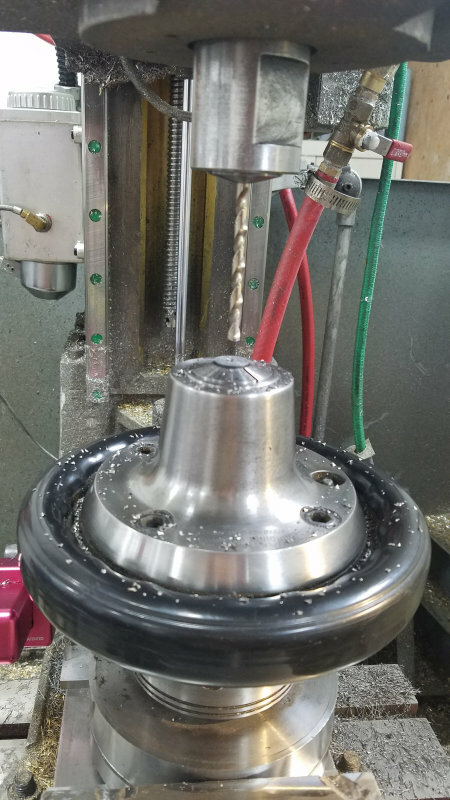 The collet will have a collet stop so that the target depth of the 7/32 drill is constant regardless of the amount of material on the base of the head. Op8: Insert head first into the collet against the stop and tighten. Peck drill 7/32. Op9: Back to lathe to part off the completed head. Tedious because of tool changes, but I got 5 of the necessary 14 complete through Op7. Part in two, drill 7/32 hole in the end, and then part at the "neck". I did these two to verify the process. Here's the rest waiting to be drilled. I spet drilled the ends on the lathe after parting and facing. 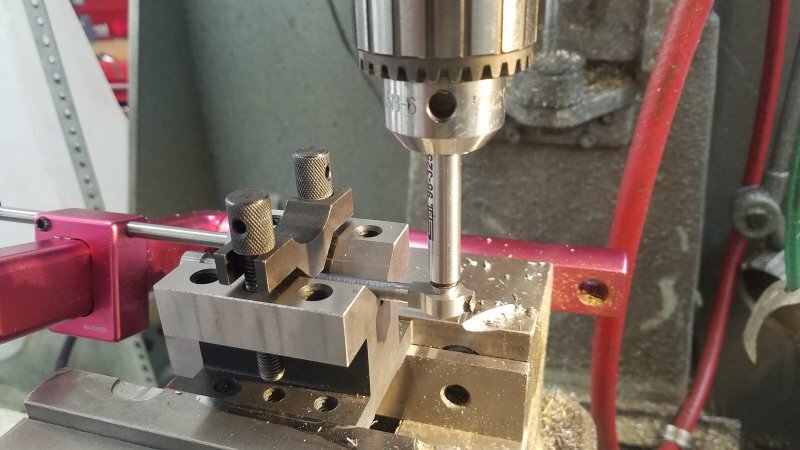 To get a consistent depth drilling, I used this setup with a collet stop in the collet. I measured the first piece to determine how deep to go from the exposed end, then set that at Z0. Thus, none of them risked the drill breaking into the cross hole. Each pair of stays have different lengths than the other pairs. This fixture allow assembly. 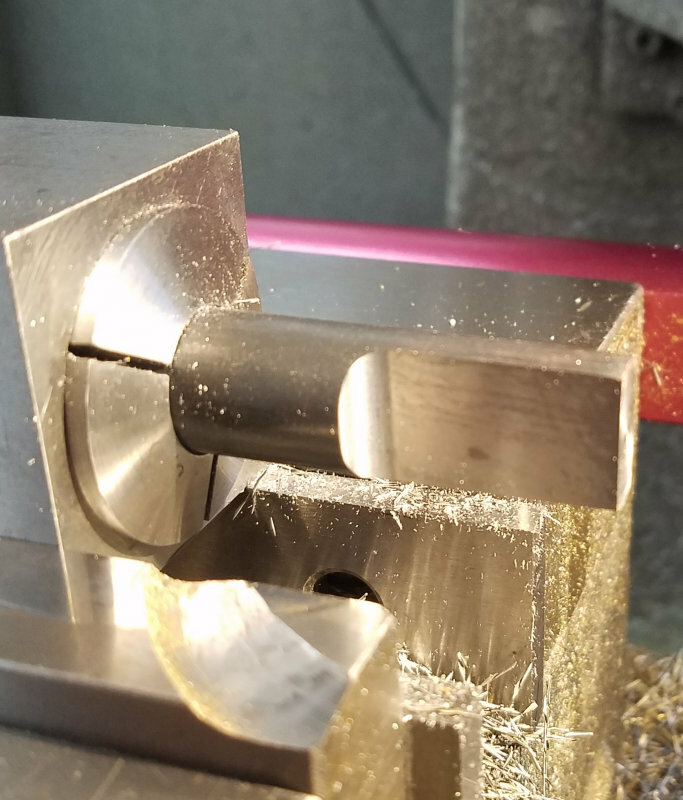 I used a 1/14" endmill to drill properly spaced holes that accept some 1/4" drill rod in a tight fit. Then cut some 7/32 drill rod to fit tightly in each end while the ends are held by the pins. Basically started with each rod a bit long and whittled down on the lathe until a good fit was attained. Then Loctite 620 on the ends and back onto the fixture to cure. To fit the single ended (vertical) ones, I scribed a line along the Y axis at X0, the drilled a hole at X 90 mm. Then adjusted the length of the rod until the bottom lined up with the line. Since I made the heads 1mm wider than the old ones, I'll need to adjust the spacers on the cross rods when I reinstall them. I have never seen a collet holder like that - looks like a wheel hub? What is the black ring, and why does the holder flare out like that? 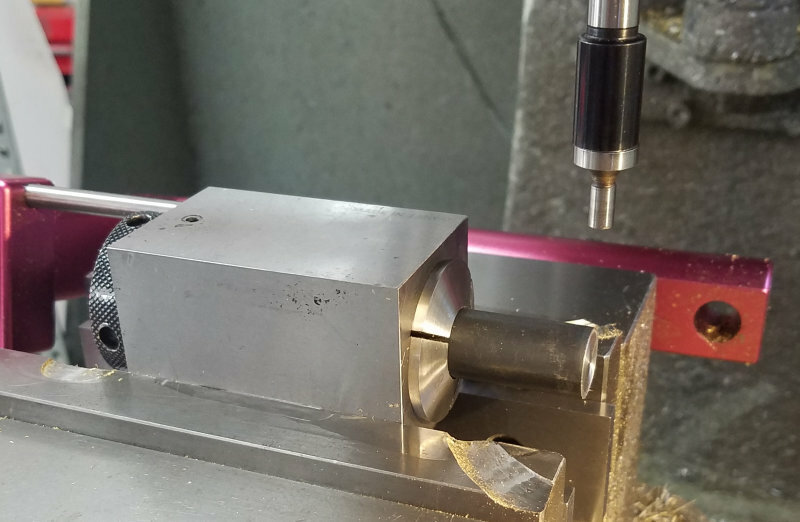 It's a Hardinge collet chuck that mounts on my lathe with a d1-3 spindle. The black ring is turned to tighten/loosen the collet. 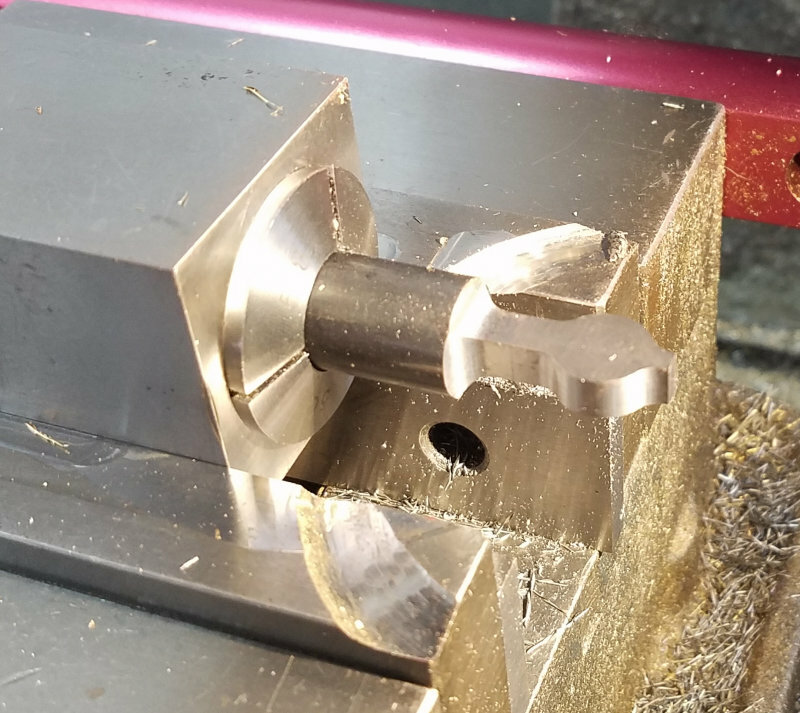 I have a repurposed d1-3 spindle nose clamped in the vise that allows me to mount lathe chucks on the mill. In the past its main used was holding round stock for thread milling studs. Very handy for the Jpy engine build. An afternoon in the shop allowed some decent progress. 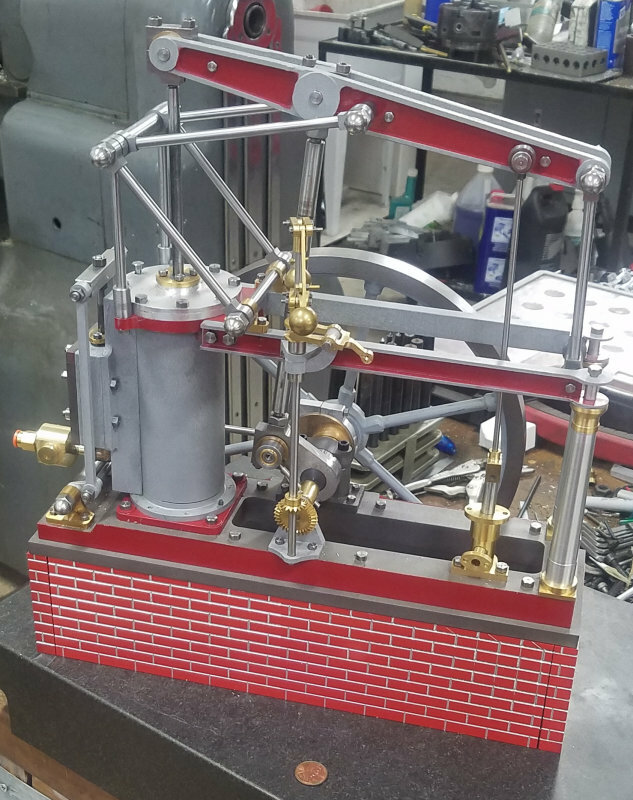 After installing the steel stays, which went fairly well with only some trimming on a few spacers, I wanted to fabricate a way to attach the bottom of the engine to the brickwork. To do this, I squared up two pieces of 1/2" aluminum that are attached to the end walls with 8-32 screws. The lower base of the engine was separated by removing the 6 screws, and I drilled and countersunk holes on each end for 8-32 screws. Then after placing the base onto the brickwork, I used a transfer punch to mark the blocks on the walls. Then the blocks were drilled and tapped, so that the base could be attached firmly. Since the base and brickwork can be separated easily from the engine, it will make transporting it more easily separately. 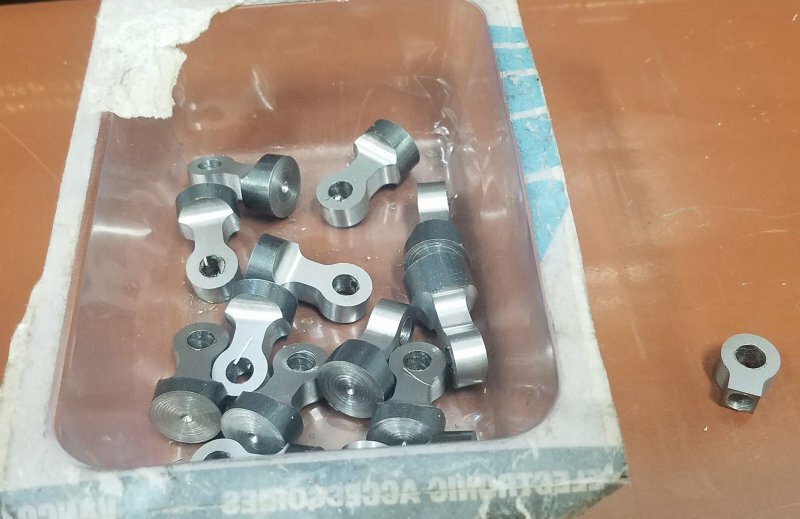 The major pieces left to do are those for connecting the governor collar to the dummy valve. Notice how I emulated George Britnell and show a penny for scale. Beautiful engine Kirk! Coming together nicely. Are you sure that’s the same penny George is using? George uses an older, more elegant, wheat cent reverse. Very nice Kirk. Looks grsat. I'm STILL convinced George has a 'special' penny he uses for scale. Nah, he has that shrinking machine from Fantastic Voyage! After some intermittent shop time I finished the governor link, shortened and replaced some screws, and figured I was ready to retime the engine and see how it runs. All went well for a few minutes; found some interference between the conrod and governor connection and fixed that. The after some more "air time" the engine stopped running. I removed the steam chest cover and discovered that the valve travel had changed. There is a fair amount of wiggle in all the linkages between the valve rod and eccentric, but the main culprits seem to be the two nuts at the end that position the valve in the center of its motion. They need jam nuts or lock washers to prevent the motion from loosening or turning the rod. The rod is too short for these. The alternative to doing so is to make the hole through the crossbar threaded. Then the two nuts would be jam nuts themselves. To save remaking parts could you add a set screw hole at right angles through the cross bar to lock the rod in place once it has been adjusted with the screws? Bad Behavior has blocked 12935 access attempts in the last 7 days.